Headphone amplifiers as referred to here are commercially available separate devices, sold to a niche audiophile market. These devices allow for higher possible volumes and superior current capacity compared to smaller, cheaper amplifiers that are used in most audio players. In the case of the extremely high-end electrostatic headphones, such as the Stax SR-007, a specialized electrostatic headphone amplifier or transformer step-up box and power amplifier is required to use the headphones, as only a dedicated electrostatic headphone amplifier or transformer can provide the voltage levels necessary to drive the headphones. Most headphone amplifiers provide power between 10 mW and 2 W depending on the specific headphone being used and the design of the amplifier. Certain high power designs can provide up to 6W of power into low impedance loads, although the benefit of such power output with headphones is unclear, as the few orthodynamic headphones that have sufficiently low sensitivities to function with such power levels will reach dangerously high volume levels with such amplifiers. 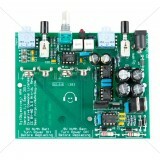 JDS Labs - Objective2 Assembled PCB Overview: Ready to use Objective2 (O2) headphone amplifier..